Most committed by Fernandinho, I'd imagine. @Iain, I've said that a million times: yellows are wiped AFTER this game to avoid having a player miss the final due to accumulation. Mike, you're right and I'm wrong. I thought they were gone today! 51" - Brazil now with a free kick 30 yards out - it's on the right, but central enough to have a crack at goal. Bashel, I owe you an apology too. Must have misheard/read that. Brazil work a short routine, Neymar crosses in, and Zapata clears with a header - but it's given as a goal kick. Yet more poor officiating. Marcelo drives down the left and gets a deflected cross in, which David Ospina does well to claim... and it's a free kick. Why? I couldn't say. Is that Fernandinho foul stat a "per minute"? You are a BR officer and a gentleman, good Sir Iain. The whistles are getting silly already. 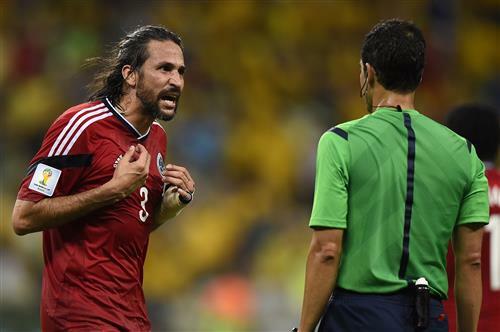 Mario Yepes saying what everybody's thinking. 32 fouls and 0 yellow cards i cant believe it! Like the first game, this one is becoming less compelling by the minute. 55" - so many, many fouls have interrupted the flow of this one, and Colombia are struggling to find any sort of flow.